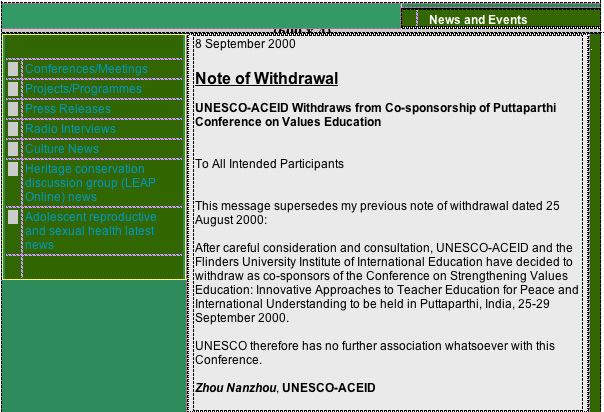 Paris, September 15 – UNESCO has decided it will no longer sponsor nor take part in a conference it had been due to co-organize with the Institute of Sathya Sai Education (ISSE, Thailand) and The Flinders University Institute of International Education (Australia), in Puttaparthi, India, from September 25 to 29. The decision means UNESCO is no longer associated in any way – through sponsorship, organization or participation of any kind – with the conference on Strengthening Values Education: Innovative Approaches to Teacher Education for Peace and International Understanding. The notice of withdrawal remained there for some years until the Indian government was begged by Sai Baba officials to take up the matter with UNESCO and demand its removal. The prime mover in this action was leader of Sai Baba’s propaganda machine – the credulous physicist Dr. G. Venkataraman (who believes fully that SB was God Creator of the Universe!) a besotted Sai Baba devotee and former atom bomb programme worker who revelled in his role as close associate and backer of the Creator Himself! INCIDENTALLY, DESPITE CLAIMS TO THE CONTRARY, THE UNESCO NOTICE IS STILL FOUND IN THE ARCHIVES! This entry was posted on February 13, 2013 at 7:00 pm	and is filed under Sathya Sai Baba. You can follow any responses to this entry through the RSS 2.0 feed. You can leave a response, or trackback from your own site.